Sick of seeing the same old sedans year after year? Each one more boring than the next. The all-new Hyundai Sonata breaks up the monotony of the mid-size with bold-not-boring styling and a new fuel-efficient engine. By questioning the cookie-cutter design that most sedans follow, the designers and engineers in our Southern California Design Center spent four years developing the sleek coupe-like design of the all-new Hyundai Sonata. You can see their unique point of view along the elegant curves and arcs, sculpted chrome grill and the raked roofline that give it a fluid-like feel even when it's standing still. And at the heart of the new Hyundai Sonata is the new fuel-efficient engine. When you hear fuel efficient, you automatically think you have to sacrifice performance. Not the case with the Hyundai Sonata's new 4 cylinder 2.4L GDI engine. It appeals to car lovers and nature lovers with a perfect combination of high power output and fuel efficiency. You're probably wondering how the Sonata can achieve exemplary mileage and still offer an impressive 200 horsepower. One of the ways is by being the first vehicle in its class with standard Gasoline Direct Injection (GDI) technology. Most engines inefficiently take in fuel, but with GDI fuel is directly injected into the combustion chamber providing a more precise amount of fuel into each cylinder. So, it looks like in a world of play–it-safe sedans, there is only one sedan that plays it smart. 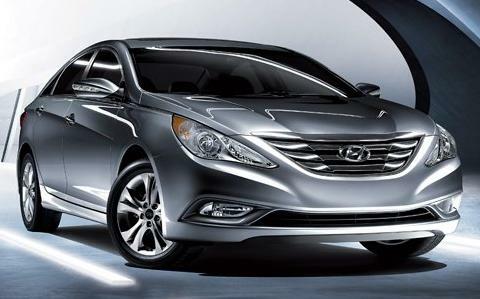 The Hyundai Sonata proves that you don't have to conform to compete. Sun, rain, snow, and the salt that inevitably follows—they all work hard to devalue new cars. Fortunately, the Sonata gets layer after layer of protection: The 14-step roto dip system ensures the primer paint coats hard to reach spots and is electro-charged for maximum adherance. It takes a certain kind of person to become a safety engineer at Hyundai. First, you have to be able to imagine all the ways in which things can go wrong. And then you have to find ways to make them right. With that as a job description, it's no wonder that our safety engineers wanted to equip the Sonata with as many features and technologies as they could. Electronic Stability Control, Traction Control and an advanced ABS braking system are standard across the board—all of which are designed to help you outmaneuver dangers on the road. And when it comes to protecting passengers, the Sonata's reinforced unibody design and advanced front airbags are there to help in the event of a crash. All of which adds up to a Sonata that's one of the safest cars in its class. And safe enough that our engineers can sleep soundly at night. It's not a list you'd normally associate with a car with a reputation for value. And yet, there they are — technologically advanced interior features and options that can make driving safer, more convenient and just plain more fun. But there's more to an interior than gadgets. Ergonomics, climate control, storage options, seat comfort — we found a way to include them all. These days, the only thing predictable about the weather is its lack of predictability. Who knows whether it'll be hot, cold, snowing, foggy, or raining cats and dogs. Fortunately, the Sonata is prepared to take on the elements, and look good while doing it. It starts with our opposite-electric-charge roto-dip primer process that actually pulls paint into hard-to-reach spots, creates a seal around the chassis, and protects it from rain, salt, and other things that cause rust and corrosion. The brain is an amazing instrument — it has a lightning-quick ability to sense danger. Unfortunately for us, in the time it takes the brain to send a signal through the neural networks and down to your braking foot, well, a lot can happen. But Electronic Stability Control (ESC) takes only a fraction of a second to detect when things are going awry. Based on how hard or how quickly you steer, a veritable army of sensors — which measure yaw, lateral G-force, steering wheel angle and the speed of all four wheels — determines whether your intended path and your actual path are in sync. If ESC determines that the car is plowing, or turning less than you intended, it provides extra braking force to the rear inside wheel; if the car is fishtailing, or turning more than intended, it provides extra braking force to the front outside wheel. ESC is bundled together with Hyundai's Traction Control System (TCS). TCS keeps tabs on your tires, and if it detects that you don't have the grip you need, it will reduce wheelspin, allowing you to accelerate on gravel, snow, and other slippery or uneven road surfaces.